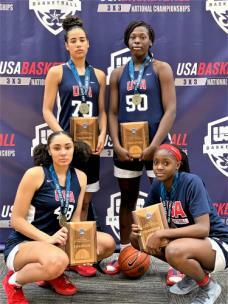 TGB, with two local high school standouts, captured the USA Basketball 3X3 U18 national championship Sunday in Colorado Springs, Colorado. Clockwise from top left, Madison Hayes, East Hamilton High; Olivia Cochran, Carver High, Columbus, Georgia; Raven Johnson, Westlake High, Atlanta and Treasure Hunt, Hamilton Heights. A USA Basketball 3x3 team with two Chattanooga standouts on the four-player roster captured the 2019 national championship Sunday at the United States Olympic Training Center in Colorado Springs, Colorado. The TGB team, which normally plays under FBC United Hunt, that includes Madison Hayes of East Hamilton High School and Treasure Hunt of Hamilton Heights, won four straight preliminary games on Saturday. TGB posted two wins against Team Quest, which had three players that won Gold in the 3X3 Youth Olympic Games. On Sunday, in medal round contests, TGB defeated Her-Ricanes, 17-16, in the quarterfinals, clipped Blue Star 30 Stars, 21-11, and edged Team Quest, 21-17, in the championship game. The other two members of TGB are Olivia Cochran of Carver High School in Columbus, Georgia, and Raven Johnson, from Westlake High School in Atlanta, Georgia. Hayes made a bucket and two free throws and then delivered a clutch 3-pointer later in the title game. Hunt hit a layup to provide TGB with the winning points. The first team to 21 is the winner in 3x3 hoops. The national title is another feather in Hayes’ hat after being selected as the District 5-3A Player of the Year and taking home the TSSAA Class 3A Miss Basketball award that capped her junior season. Hayes beat out Oak Ridge’s Jada Quinn and Houston’s Jayla Hemingway for the Miss Basketball honor. Hayes averaged 24 points, 12.5 rebounds, 3.7 assists, 3.5 blocks and 3.2 steals this past season. She is being recruited by 30-plus colleges and may have picked up even more interest during the weekend games at the USOTC facility.